The Muni Seva Ashram in Goraj, near Vadodara, India, is a tranquil haven of humanitarian care. The Ashram is hugely sustainable, next year it will be completely carbon neutral. Its first solar panels were installed in 1984, long before climate change was on anyones agenda. Their energy is provided from solar panels, and wood grown on the estate. Waste food and animal manure is turned into biogas to run the estates cars and also used for cooking. 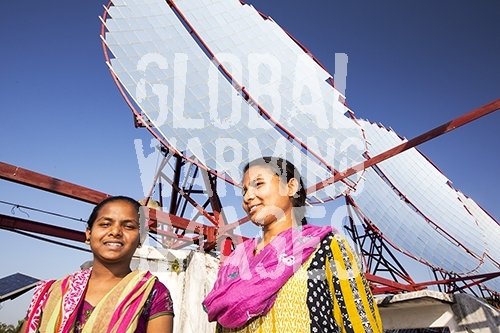 Solar cookers are also used, and the air conditioning for the hospital is solar. 70 % of the food used is grown on the estate. They provide an orphanage, schools for all ages, vocational training, care for the elderly, a specialist cancer hospital with state of the art machinery, and even have a solar crematorium. This shot shows solar panels that focus the suns rays on heat exchangers to boil oil, which is then sent down to the kitchens below to heat the cookers.